I am on Day 2 of a getaway with my husband. This is the longest we've been away (3 nights, 4 days) and it's pretty exciting for us. We drove to Vermont, and spent last night at the lovely The Pitcher Inn in Warren, which is about 3 miles south of Sugarbush (for those of you that ski). Unfortunately the restaurant at The Pitcher Inn was closed (only on Tuesdays), so we went to The Common Man for dinner. 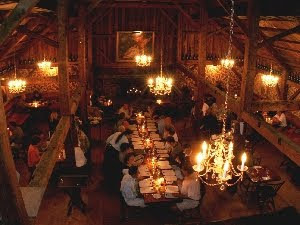 It was so great--very rustic while grand barn interior, with empty bottles of Dom lining the walls (its a tradition there, where people who are celebrating buy one, and then write their names and dates on it)...and great food. Huge portions, which pleases the locals, but I would just share one entree next time. We had microgreen salads, duck with risotto, and quail with a johnny cake and bacon on top (two quails in one entree and it was $23), and it was all delicious. I'll write about The Pitcher Inn and American Flatbread later this week. After all, I am supposed to be on vacation with my husband.